Sat. 11/18: 2 pm Sew What? 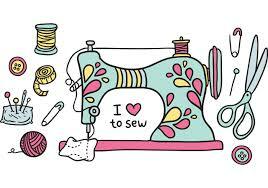 Come to the library and explore several different decorative items that can be sewn on the library’s sewing machines. Beginning to advanced skills are both welcome, as are teens age 13 and up. Please bring 3-5 yards of cotton fabric of your choice. Choose a fabric pattern that will look nice with your own personal decor. The library will supply the machines, cutting materials and thread. Registration required. Please call 315-986-5932.